This is a unique version of the Shamrock Walkaround Day Fisher, custom built as the deck carried tender to the superyacht MY Dardenella. As such she has circumnavigated the world! Replaced by two high speed ribs after a major refit of the superyacht, the owner decided to keep the tender for his own use. 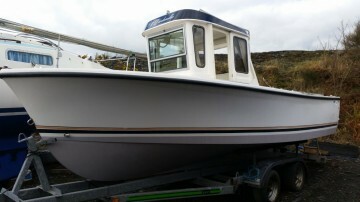 He purchased a heavy duty trailer for her and brought her to Scotland where she has done excellent service as a fast, comfortable day boat on the West Coast. She also comes with a huge supply of spares (as were carried on the superyacht). The big, unstressed Yanmar diesel engine gives excellent performance yet is economical to run and will run all day at tickover. Fitted with removable extra seating she can easily carry six (from her days as a tender, ferrying crew and passengers to shore). She is shallow draft with protected propeller and rudder and can safely take the ground. She is the perfect day boat, powerful yet economical, ideal just for family day cruising or perfect for fishing with wet boxes and plenty of room for rods and gear. The custom made 4 wheel Tyrone-Snell trailer has only done around 500 miles and never been immersed in the sea, a boat hoist being used for launching. Complete rewire of electrics carried out in autumn 2015. Ready for immediate use with a fresh coat of antifouling. Complete with the trailer and spares, this is a real bargain not to be missed. Garmin GPS Map 550S, compass, vhf radio. 12 volt. Re-wired in 2016 by Boat Electrics & Electronics Ltd in autumn 2015. A heavy duty, high output solar panel is installed on the wheelhouse roof and keeps the batteries in perfect condition. Heavy duty, custom made 4 wheel Tyrone-Snell trailer has only done around 500 miles and never been immersed in the sea, a boat hoist being used for launching.